Story: In a time of heroes, the mighty warrior Beowulf slays the demon Grendel and incurs the wrath of its monstrous yet seductive mother, in a conflict that transforms a king into a legend. 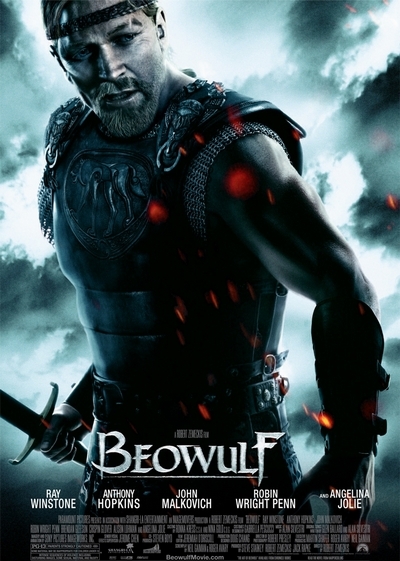 Groundbreaking director Robert Zemeckis offers a vision of the Beowulf saga that has never been told before, starring Angelina Jolie as Grendel's mother, Anthony Hopkins as the corrupt King Hrothgar, and Ray Winstone as Beowulf. The film also stars John Malkovich, Brendan Gleeson, Dominic Keating, Alison Lohman, Robin Wright Penn and Ray Winstone. The actors were motion-captured and then rendered in CGI, as was done in "Polar Express" and "Monster House". Neil Gaiman ("MirrorMask," the graphic novel Sandman and the film "Stardust") and Roger Avary ("Pulp Fiction") adapted the legend for the screen.